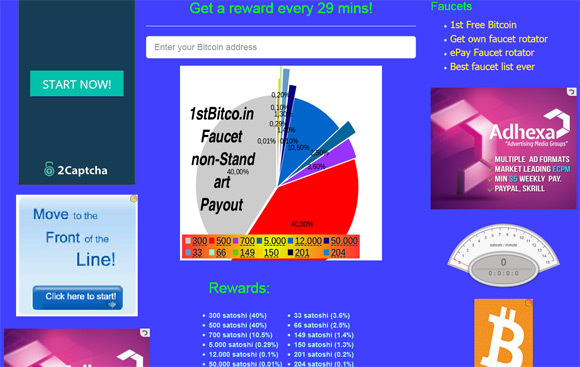 A Bitcoin faucet is a website that offer its users small amounts of Bitcoins absolutely free. Normally you have to just enter your Bitcoin address and a complete a captcha (to prevent bots) and you are getting paid some satoshi (fractions of a Bitcoin). The 1st Bitcoin Faucet is a faucet that awards visitors with with between 33 and 50000 satoshi (the chance for 300 or 500 satosh is the highest) and you can request a dispense every 29 minutes. You will receive your payment through the Paytoshi micropayment service and you need to collect at least 6000 satoshi in your account for your earnings to be sent directly to your Bitcoin wallet address. There is also a referral program paying you 60% referral commission for people you invite to use the service. No need to worry as your friends will get their full reward from the service when they claim their reward.